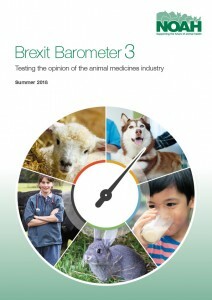 The increasingly turbulent negotiations and the strong possibility of a no-deal Brexit are causing increasing levels of concern, and in some areas negativity, amidst the animal medicines industry, says NOAH’s third Brexit Barometer. The seemingly continued lack of Government progress was revealed to be of grave concern as we move ever-closer to the March 2019 Brexit deadline. Whilst continuing to highlight recurring themes of uncertainty and concern, the third edition of the Barometer does however reveal pockets of optimism – particularly in relation to Animal health and welfare. Conversely, of the six lenses that have been examined in the Barometer[i], Trade and export and Public health and food production have seen noticeable increases in negative sentiment and uncertainty. “Increasing levels of uncertainty were a key take-out in our second Brexit Barometer report back in Winter 2017, and it is concerning to see that these are continuing to rise as we move closer to the Brexit deadline. To download the full report, click here. The next Brexit Barometer will be launched in Winter 2019. NOAH represents the UK animal health industry. Its aim is to promote the benefits of safe, effective, quality products and services for the health and welfare of all animals.